I had a lot of people tell me when I decided to make the trip why would I fly to Ukraine. As most would have known at the time, Ukraine has gone through some serious political turmoil. From a corrupt president to war out on the Eastern borders. I won’t go into details but if you Google Ukraine in the news I’m sure you’ll find a flood of articles. Because of all the fear mongering in the media, it has had seriously affect the country’s economy and tourism has dropped drastically in the last couple of years. That being said, though locals in Kiev are concerned about the East of Ukraine, they’re not nearly as worried as you’d think they’d be. Life goes on for me, they worried about work the next day, what to have for dinner, and where to go clubbing like any other majority city in the West. There are a lot of international students who live in Kiev. The majority of the ones I met weren’t exactly concerned for their lives. Everyday life was pretty much the same as it would be in Toronto. If anything, they were taking advantage of the economic situation. The currency has fallen to about half of what it was a couple years ago. This means £1 was worth ₴20 (UAH), today it’s worth ₴40, and because inflation hasn’t really caught up, most things are basically half price for foreigners. To travel to Kiev from London is relatively cheap too. Flights are pretty frequent with Ukraine International Airlines. I paid about £100 for my flight and book 2 weeks prior to flying. 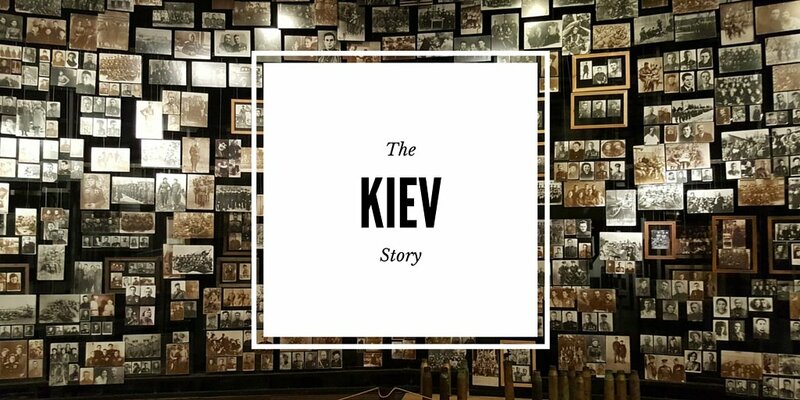 It’s likely that this won’t keep up for long, so I would definitely recommend going soon if you want to see Kiev for a good price; and the locals would agree. I do recommend staying at a hotel. Even last minute books only cost about ₴1300 which is only £35. At that price it’s not really worth looking at Airbnb. The added value of staying at a hotel too is that reception speaks English and can negotiate taxi prices for you. The city itself is relatively small. You can do a walking tour that’ll take you around to the most important sites in the city. They do two walks, one at noon and another later in the day. It’s definitely worth doing both as they’ll take you to most of the important sites inside the centre. However, the best sites are really outside of the city centre. For the majority of these locations you’ll have to take a taxi or a coach. The walking tour I went on took me around some really interesting sites around the city centre. They have some of the most funky art I’ve ever seen in any city. You have statues that are over hundreds of years old, to some that were made only half a century ago, to art that was only made in the last decade. A theme that goes across quite commonly is the theme of luck. You’ll find a lot of statues where you can drop coins inside of the statue and make a wish or prayer for good luck. There were some other really fantastical statues like the Friendship of Nations Arch, where there are two statues that are very communist-like. It almost reminds of statues you see in the news that are in North Korea. Mezhyhiria Residence is definitely a must-see. It’s just outside the city limits of Kiev. It’s the residence of ex-president Viktor Yanukovych. Since November 2014, it’s been used as a sort of museum which you can enter for ₴20 ($1). The size of the residence is pretty damn big. I’d gather it’s about the size of Hyde Park in London. Behind the estate you have the Dnieper River. The locals told me that the waterway was entirely man-made but what I think they meant to say is that the lakes near the city were man-made; but those aren’t exactly super close to the estate. I imagine over the last few hundred centuries, it wasn’t uncommon to divert river water into parts of the city for trade, agriculture, etc. The main house in the estate is a weird piece of architecture. It has a weird mix of Roman, Ski Resort, Victorian, Ukrainian architecture. Inside the estate you realize how extravagant of a life this President wanted to live. There was a house for the cars, which is now a car park. There’s a specific house as the dining hall. You’ll encounter a farm or zoo, where you’ll see all sorts of animals, including, pigs, turkeys, llamas, donkeys, horses, and deer. Right next to the farm, there’s an orchid with all sorts of fruits. Also a separate garden for vegetables. The place really is a self-contained community. Had he been able to keep the place, he probably could’ve lived her indefinitely and never have to leave with all the amenities he had and domestic help he would’ve hired. Just a random note, I’m pretty sure Viktor was a fan of Disney’s Bambi. I do recommend bringing some snacks before coming to the site. There isn’t really much in terms of cafes and restaurants inside the residence. There are quite a few pit stop stations along the way to the museum. There is WiFi around most of the estate. Like almost everywhere we were, there wasn’t a moment where my WiFi dropped. Aside from following the trails though, there is a tour of the underground that you can do as well. I didn’t do it, as we didn’t have time to, but it might be worth a visit. Back in the city, there are two really famous site that everyone has to visit while in Kiev. That’s Kiev Pechersk Lavra and the Ukrainian State Museum of the Great Patriotic War. Pechersk Lavra is a sort of religious city within the city. It’s walled estate that contains quite a few very old orthodox churches. It was definitely an interesting experience for me. Just watching locals interact with the churches, what they do before entering, how they worship their saints, the symbols that were included in the churches, were nothing like a typical Catholic church you’d find across Europe. I don’t have any photos of inside a church, out of respect, but you’ll find things like skull symbols like bones in a cross underneath it, kind of like a poison symbol. The place is definitely a place of pilgrimage for a lot of Christians. You have to pay a fee to get in, and I found that most people visiting weren’t tourists but people from around the country coming to pay their respects or to have their prayers heard. The Ukrainian State Museum of the Great Patriotic War, is another must see. The thing to remember about Kiev, is that the city has only really started to recuperate and rebuild since the fall of the Soviet Union. So, not everything is exactly super up-to-date, except WiFi. They have WiFi everywhere. At the war museum, they have this building that’s kind of like the Statue of Liberty. It’s the main exhibit of the museum grounds. The elevator to go up to the top though, seriously needed some upgrades. It really did feel like it was falling apart, but I went up anyway. But, it’s totally worth to go up. You get a really good 360 view of the city and they even have fixed binoculars that you can use. Inside the building though, it probably has some of the most interesting artifacts from the war. Entire walls of old photos left behind by the dead. Items left behind from the war, like monophonics, canisters, cigarette tins, tin lunch boxes. There was a video explaining Ukraine’s history with the war, unfortunately it was all in Ukrainian. They had a lot of Nazi items on display, something you don’t often see in Berlin war museums, since after the war they went through a lot of effort to destroy anything Nazi related. Ukraine definitely has a lot commonalities with it’s Russian cousin. But, kind of like how people mix Canadians with Americans, it’s the little things that define us. I had dinner with my Dad’s co-workers and they were going into details about the differences. Like how green borscht is part of Ukrainian cuisine and not Russian. They took us to a restaurant called Kanapa for some traditional cuisine. Just take a look at the photos down below, they do some really interesting dishes. Borscht in a cabbage bowl, butter candles for dipping bread, and vareniki which are dumplings. This place was considered super fancy for Kiev, but it was by no stretch expensive. The most expensive dish was only £12 and can be as cheap as £4. I ended up getting 5 courses, just so I could eat a variety of food; who knows when will be the next time I come to visit! The food around the city in general though is ridiculously cheap. McDonalds in Kiev is probably one of the cheapest in the world and being there only proved it. You can find the Big Mac Index here. It’s roughly under £1 for a Big Mac. The only that is expensive by comparison, is water, but only in restaurants. Literally, bottled water in a restaurant can cost more than your actual meal. I’m talking ₴200 which is £5. However, if you go to a grocery store like Auchan, you can find a 2 litre bottle for less than 50p. If you do drink anything though, the flavoured vodka is a definite must. Most bars will serve local flavours. It’s definitely a place I would recommend for anyone to visit. They’re doing their best to push more tourism to come to the city so definitely take advantage of it. The city is super welcoming. The walking tours are always a good way to start off and get some tips from a local. It’s really like any other European city at the end of the day. Be careful and watch out for people who might try to scam you. Now head down below for more photos of the trip!